Do you have the Christmas let down blues? Are you looking for something new to look forward to? Well, perhaps you'd like to take part in my Accessory Bag Swap! Please keep in mind . . .for those of you who fear zippers, there are nice patterns out there without zippers, such as this free Moda pattern. This swap is coming on the heels of Christmas, I totally think this would be a good opportunity to use some scraps from your sewing room. 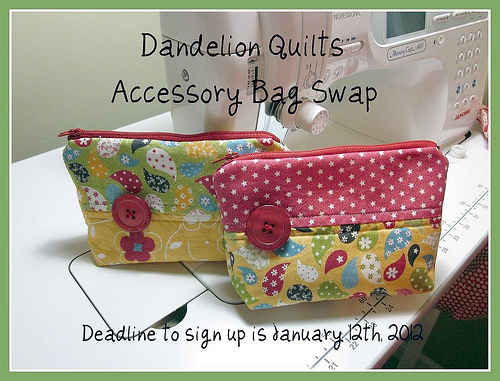 There is no need to spend a lot of money on this bag swap. What kind of accessory bags might work? Hmmm....it is really up to you, perhaps it is a small change purse or a make up bag or some sort of bag for jewelry when you travel or a clutch for a night out or a sewing bag to hold tools or an ipod case. A accessory bag. 1. You must e-mail me to sign up. My e-mail is located in my profile information. 2. Create a homemade accessory bag. Send it to your partner by Saturday, February 11th . Please only sign up if you feel you can make the deadline. No one enjoys not receiving a swap package when they put a lot of effort into theirs. If an emergency happens, be kind and let your swap partner know when you feel they can expect to receive their package. Also, please let me know when you ship. 3. After you have received your package, please email or snail mail your partner a letter thanking them. 5. Would you be willing to ship international? UPDATE: This swap registration is officially closed. While I haven't quite worked this out yet, I am sure there will be a drawing for a prize for those who get their swap packages out EARLY. To be entered in the EARLY BIRD SPECIAL drawing, your bag should be out by Monday, February 5th and I should have your email saying that you did so. lI can do this!! Love to make bags. This is going to be a fun swap. Love the pouch. No swaps for me but it looks like fun - enjoy hon! Can't swap because we'll be on the road, but it sure looks like fun Kris! I sent an email. I'd love to participate. So excited! Just sending an email would love to join in. So glad I found out about this swap .... what fun! Thank you, thank you!! This should be lots of fun! thank you, I've sent my email. Bags are my THING so I must sign up for this one! Already sent my info! Sending my info. 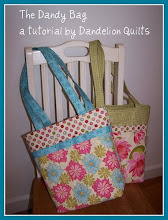 Love the little bag you have pictured and would like to make it. What pattern did you use for the bags in your button? I like the two fabrics and the button. Count me in! This will be my first swap and I'm so excited about it :-) I just got a new bag pattern that will be perfect for this! How fun :-) Thanks so much! I missed the sign up date. If there is going to be another, please let me know. Just your average mom trying to make the world better one quilt at a time.